The workshop aims at understanding the institutional change that occurred in three European cities. 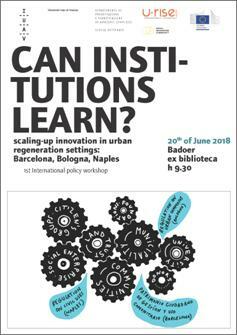 Barcelona, Bologna and Naples are foreseen as main cases with regard the coproduction between social innovative practices and local institutions in urban regeneration settings. These cities have gone through very different policy frameworks in the management of underused or derelict public properties. The Patrimonio ciudadano de gestión y uso comunitario in Barcelona, the ‘Rules for the regeneration of urban commons between citizens and the Municipality’ in Bologna and the ’Civic Uses’ in Naples are among the few attempts to push the municipal government to become a ‘learning institution’.